Objective An increasing number of patients in the working population are undergoing total knee replacement (TKR) for end-stage osteoarthritis. The timing and success of return to work is becoming increasingly important for this group of patients with social and economic implications for patients, employers and society. There is limited understanding of the patient variables that determine the ability to return to work. Our objective was (from the patient's perspective) to gain an insight into the factors influencing return to work following knee replacement. Setting and participants This qualitative study was undertaken in a secondary-care setting in a large teaching hospital in the north of England. Semistructured interviews were carried out with 10 patients regarding their experiences of returning to work following TKR. Outcomes Interviews were transcribed and analysed using a qualitative thematic approach to identify the factors influencing return to work from the patient's perspective. Results Three themes were identified that influenced the process of return to work, from the patient's perspective. These were delays in surgical intervention, limited and often inconsistent advice from healthcare professionals regarding return to work, and finally the absence of rehabilitation to optimise patient's recovery and facilitate return to work. Conclusions There is currently no consistent process to optimise return to work for patients of working age after TKR. The impact of delayed surgical intervention, limited advice regarding return to work, and a lack of work-focused rehabilitation, all contribute to potential delays in successful return to work. There is a need to change the focus of healthcare provision for this cohort of patients, and provide a tailored healthcare intervention to optimise patient outcomes. Successful return to work is increasingly recognised as an important outcome for patients following joint replacement, with social and economic implications for patients, employers and society. The information regarding factors influencing the process of return to work from the patient's perspective is limited. Qualitative research methods were used to gain an understanding of patients’ experiences following total knee replacement. This study was undertaken with a small sample at a single site, and the extent to which these findings relate to other regions and groups of patients is unknown. However, this work highlights the need to review the focus of healthcare provision for this cohort of patients and provide a tailored healthcare intervention to optimise patient outcomes and return to work. We performed semistructured interviews with 10 employed patients who had undergoneTKR. We focused on the preoperative and early postoperative phases of the patient's journey, with a view to identifying why certain factors may influence a patient’s return to work, and potential deficiencies in the delivery of care directly pertinent to return to work. This qualitative study was performed at a large teaching hospital in the north of England. Interviews were carried out with 10 patients over a 4-month period between December 2013 and March 2014. Participants were selected from a cohort of 50 TKR patients recruited into a population-based postal questionnaire study investigating barriers and facilitators to return to work after joint replacement carried out at the same institution.19 All patients were under the age of 60 years at the time of primary knee replacement surgery for OA. The aim of this study was to identify factors influencing return to work following knee replacement; therefore, patients were excluded from interview if they were unemployed in the 3 months prior to surgery. From the cohort of 50 patients, 37 patients were in employment preoperatively, and consented to be approached for interview. From these, purposive sampling was used to select patients with a range of characteristics known to influence rates of return to work such as age, gender and type of employment. Interviews were undertaken with 10 patients. Our aim was to gain a greater insight into the factors influencing return to work from the patient's perspective, and to identify key themes to inform future research in respect to optimising return-to-work outcomes. 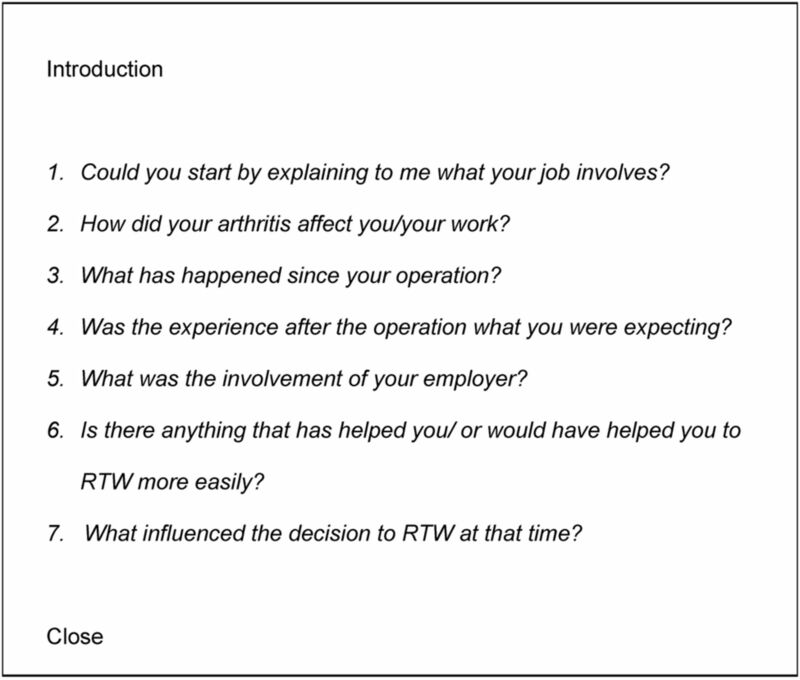 Patients were asked to discuss the impact of their knee symptoms and surgery on work participation incorporating both preoperative and postoperative experiences during the interview. A semistructured topic guide was used to allow the patients to talk freely about their experiences and expand on any aspects they felt were relevant (figure 1). This resulted in a large variation in the length of interviews (30–100 min), but allowed patients to discuss important issues not previously considered by the researchers, and their impact on the patient's experience of return to work. Interviews were undertaken by a trained research physiotherapist in the Musculoskeletal Outpatient Department of a large teaching hospital. Interviews were audio recorded and transcribed verbatim. All data was stored on a secure electronic data base, and paper copies filed in the Clinical Research Office, and complied with trust Caldicott Principles and the Data Protection Act (1988). Written informed consent was obtained, and interview participants were allocated an identification number which was used throughout the study to ensure anonymity and maintain confidentiality. The process used for analysis was based on thematic analysis as described by Braun and Clarke.20 Commonly used in healthcare research, thematic analysis is a qualitative descriptive method, which is independent of any one theory and epistemology. Thematic analysis was chosen as it specifies an analytical approach to coding and theme development, and has been successfully applied to qualitative questions such as lived experience and patients’ understandings and perceptions.21–23 Using thematic analysis enabled the researchers to identify, analyse and report patterns (themes) across the data set, as well as working with a priori themes to provide a detailed account of the data and identify key issues in an area, where to date, there had been little research. The transcripts were revisited to ensure the resulting themes reflected the patient's experiences. A second experienced qualitative researcher (JL) verified initial codes and subsequent analytical themes to ensure internal validity in relation to the data set. The resulting themes and supporting data were also reported and discussed at regular meetings of the research team as a process of member validation. Anonymised verbatim quotes followed by the corresponding patient’s study identification numbers are used throughout this section to illustrate key points. Patient demographics, employment details and time to return to work are reported to add additional context to the data (table 1). Return to work indicates the time taken to return to the place of work to either full or modified duties. Three themes influencing the patient's experience of return to work following TKR were identified from the interview data. These were delays in surgical intervention and the impact on work participation preoperatively, limited and often inconsistent advice from healthcare professionals regarding return to work, and finally the absence of rehabilitation to optimise the individual’s recovery and facilitate return to work. Patients reported the physical and psychological impact of delayed intervention as well as the resulting lost working days, financial implications, and the negative impact on their sickness record and future employability. This qualitative study has explored the accounts and experiences of patients returning to work after TKR and identified three key factors influencing the patient's experience of return to work. Patients reported delays in surgical intervention and the subsequent impact on work participation preoperatively, limited and often inconsistent advice regarding return to work from healthcare professionals and, finally, the absence of rehabilitation to optimise individuals’ recovery in relation to return to work requirements. There are some limitations to this work. This was a single-site study representing a geographical area in the northeast of England. All patients were white British and under the age of 60 years at the time of surgery, therefore, the extent to which these findings relate to other regions and groups of patients is unknown at present. This study identifies factors influencing return to work following knee replacement, and patients not in employment prior to surgery were excluded from interview. The impact of OA on work participation and delayed intervention was identified in the study, but the experiences of patients forced out of work due to the impact of OA, or patients attempting to regain new employment following surgery were not addressed in this study. The retrospective nature of this study reports patients’ experiences up to 36 months following surgery which will inevitably result in a risk of recall bias. Owing to the constraints of time, the number of interviews undertaken was limited to 10, however, the aim of the study was not to reach data saturation but to identify important key themes. It is also worth highlighting that this study has presented the factors influencing return to work from the patient's perspectives, it does not report the perspectives of the healthcare professional or the employer but does identify their involvement in the process. Patients in this study identified that the standard advice and treatment they received from their healthcare providers reinforced their perception that joint replacement is a surgery for the elderly, retired population. The increasing number of knee replacements performed in patients of working age has been well reported, and is projected to continue to rise exponentially.7 The findings of this study suggest that the increasing demand for TKR in the employed population has not been reflected in the patients’ and clinicians’ perceptions of the joint replacement patient, or in the subsequent provision of healthcare. Patients in this study identified a need for advice regarding work participation to be tailored to their individual employment needs. There is paucity of information in the literature to guide clinicians in advising patients regarding return to work following joint replacement. There are basic guidelines available in the grey literature such as the return to work guidance published by The Royal College of Surgeons,34 however, the extent to which such guidance is referred to is unknown. Generic guidance is available regarding the use of the ‘Fit note’ introduced in 2010.35 Patients’ experiences of the Fit note were not specifically included in the interview schedule, however, two of the 10 interview participants made reference to the ‘fitness for work’ or ‘sick note’ being extended over the phone, or being ‘signed off’. Recent literature also suggests wide variation in its use for managing sick leave.36 The impact of advice and return to work interventions has not previously been reported in this group of patients. Previous work in other areas of surgery identified wide variations in the provision of advice to patients regarding absence due to sickness,37 ,38 and reported that the advice given by healthcare professionals appeared to have the greatest influence on return to work times, with patients tending to adhere to any advice that is given irrespective of its duration. Patients in this study were often advised to stay off work for longer than necessary with potential resultant costs to patients, employers and society. Consistent advice pertinent to the individual's employment could minimise the social and economic impact of time off work from TKR. Limited preoperative advice regarding return to work also means that patients may have unrealistic expectations. Patients with unclear expectations of their surgery will not be in a position to make a fully informed decision regarding whether or not to undergo knee replacement. Recent literature has highlighted the need for improved decision-making about the timing and indications for TKR, and the need to reduce variability in provision of surgery through education, training and the use of well-designed decision aids.5 ,39 The advice and information we provide patients with is instrumental in allowing better decision-making. Patients also described that rehabilitation was limited to the needs of the elderly retired population, and their requirements for return to work were not considered. A generic rehabilitation as described by patients in this study may not optimise a patient's ability to return to work. The concerns identified by patients in this study reflect findings of previous work. A systematic review of the effectiveness of physiotherapy exercise after knee replacement for OA40 reported that ‘interventions to date have largely consisted of exercise programmes and gait rehabilitation, mainly targeting impairment and helping patients to recover from the effects of surgery rather than specifically targeting limitations in activity or restrictions in participation’.33 Return to work is not specifically discussed within the review, but it provided support for the use of physiotherapy exercise interventions with exercises based on functional activities rather than the traditional home exercise as described by patients in this study. Directed employment focused rehabilitation could potentially affect patients’ physical ability to perform work-related tasks, but also to prepare them psychologically, giving them the reassurances and confidence needed to reduce anxiety surrounding reintegration back into the workforce. Successful return to work is being increasingly recognised as an important outcome for this group of patients with social and economic implications for patients, employers and society. Recent studies have focused on predictors and rates of return to work rather than exploring why such factors influence the process of return to work. This study has highlighted that there is currently no consistent process to optimise return to work for patients of working age after TKR. The impact of delayed surgical intervention, limited advice regarding return to work, and a lack of work-focused rehabilitation all contribute to potential delays in successful return to work. There is a need to change the focus of healthcare provision for this cohort of patients and provide a tailored healthcare intervention to optimise patient outcomes. Improvements in delivery of these three aspects of patient care should be demonstrated by a high-quality interventional trial to determine the impact and efficacy on work participation following joint replacement. It is our hope that such an intervention will become integral to the service provided to this increasing cohort of patients.
. ‘Toothache stories’: a qualitative investigation of why and how people seek emergency dental care. Community Dent Health 2003;20:106–11.
. Is work good for your health? [Miscellaneous]. J Bone Joint Surg Br 2008;2008:487–8.
. Qualitative research in health care. Blackwell, 2006.
. Thematic analysis. In: Rohleder P, Lyons AC, eds. Qualitaive research in clincial health psychology. New York: Palgrave Macmillan, 2015:95–113.
. The public health researcher: a methodological approach. Melbourne, Australia: Oxford University Press, 1997.
. NIH consensus statement on total knee replacement December 8–10, 2003. J Bone Joint Surg Am 2004;86:1328–35. Getting the most out of the fit note. https://www.gov.uk/government/uploads/system/uploads/attachment_data/file/447605/fit-note-gps-guidance-jan-15.pdf: Gov.co.uk; [cited 2015]. Ethics approval Local R&D approval was obtained (R&D ref: 6525) and ethical approvals were granted by the Proportionate Review Sub-committee of the NRES Committee London (REC ID: 13/LO/0719).